Why is surgical stainless steel cookware the very best type with which to prepare your family’s meals? Several benefits top the list. When cooking in surgical stainless steel, meats can be cooked in their own juices without having to use extra oil or fats. Vegetables can be cooked in a very small amount of water, which means that vitamins and minerals are retained in the food instead of being boiled or steamed away. Cooking via stainless steel requires lower temperatures, which again, helps retain vitamins and minerals since important nutrients are lost when food is exposed to high temperatures. Surgical stainless steel is inert, so it doesn’t react with acidic or alkaline foods, thereby retaining the pure flavor of foods. Stainless steel doesn’t allow tastes from the metal to leach into the foods. A vapor-seal is created during cooking which keeps food moist and juicy by allowing it to cook in its own natural liquids. Only the stainless steel outer layers come in contact with the food, so they protect the food from the corrosive properties of the inner layer metals. Surgical stainless steel is hygienic, which is why it is used in making surgical instruments that can be kept clean and sterile. Low heat cooking eliminates the creation of high heat toxins that release toxic fumes. The surface of stainless steel does not flake, so pieces of the material do not break off and enter your food as is true for most non-stick cookware. Stainless steel is non-porous and non-corrosive, so bacteria and germs do not build up in the metal. The recommended use of low heat cooking with stainless steel saves energy. High quality stainless steel has a much longer service life than cookware made from other materials, so it does not need to be discarded often. A large amount of new stainless steel is made from scrap metal that has been recycled. When stainless steel cookware does need to be discarded, it is 100% recyclable. It has a natural corrosion resistance. Low heat cooking with stainless steel conserves energy, thus reducing your utility bill. Many “oven” dishes, such as roasts, can be made on the stovetop in stainless steel cookware, which saves energy since ovens require more power than stovetop burners. Quality stainless cookware is designed to transfer heat across the bottom of the pans and up the sides to heat the food. Thus, heat is transferred more efficiently, which allows for stack cooking and results in lower heat settings and reduced cooking time. 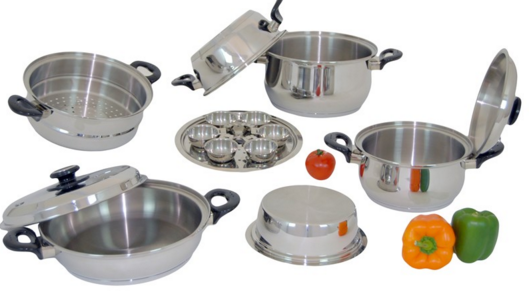 Quality stainless steel cookware is made of high grade 304 surgical stainless steel. The chromium in 304 Surgical Stainless Steel combines with oxygen in the atmosphere to form a thin layer of chrome-containing oxide. If the metal is cut or scratched and this layer of oxide is disrupted, more oxide will form and recover the exposed surface, protecting it from oxidative corrosion. Stainless steel doesn’t pit, chip, or rust. It is resistant to scratches, dings, and dents. Stainless steel is long lasting. Most surgical stainless steel cookware sets come with a lifetime warranty. Stainless steel layers encase an inner layer(s) of a heat conducting material, such as aluminum or copper. In high quality sets, this inner layer transfers the heat across the bottom and up the sides of the cookware, efficiently cooking the food, but allowing the food to only have contact with stainless steel. In a high quality stainless set, the bottom of the cookware is flat so it hugs the burner to ensure maximum heating efficiency during the cooking process. The strong, rigid material is constructed to prohibit warping and “hot spots,” which further increases efficient heat transfer. The inside of the pan bottoms have a heat-diffusing satin finish. Stainless steel maintains its bright, sparkling shine through many years of use. The durable mirror finish on the outside and satin finish on the inside will continue to look good through the lifetime of the cookware. The beauty of stainless steel complements the visual appeal of your kitchen. The easy cleaning ability of stainless steel makes it the first choice for facilities that have strict hygiene conditions, such as hospitals, kitchens, and food processing plants. Stainless steel can be washed with soap and water, or can even be placed in a dishwasher. Any spots or discoloration that might appear can easily be removed with cleansers such as vinegar and baking soda paste or Bar Keeper’s Friend. Surgical stainless steel cookware sets come in a large variety of brands, sizes, quality, and prices to meet the needs of a large variety of consumers. Companies produce various types of pieces that can be interchanged and used in numerous ways, which adds to the versatility of using stainless steel cookware in your kitchen. Extra pieces designed for special tasks can be purchased to round out basic sets. How to Detect Water Softener Problems How to unclog a garbage disposal What Makes Memory Foam Mattress A Great Gift For Your Loved Ones? The Perfect Pressure Washer for Auto Detailing Jobs Where To Start Your Search For A Cheap Mattress When do You Need A New Mattress?